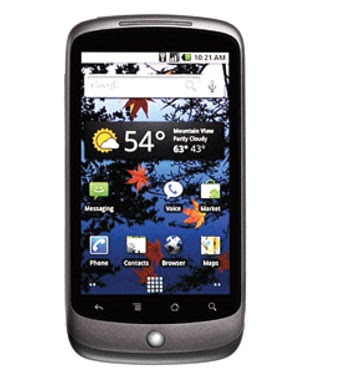 Google Nexus One is google's new mobile technology which was introduce on 5, Jan 2010. This phone is seems to be Google first ever mobile technology. The phone is already in use, and website log data suggest it is running Android 2.1. Nexus One is based on Android programming which Google own. Many people are comparing Google Nexus with Apple iPhone 3Gs. But whats behind it we will comes to know soon. Comparison of Google Nexus One with iPhone 3Gs. Google Nexus One is slightly thinner than the iPhone 3GS, and slightly lighter. No hard specs were thrown around, unfortunately, since Google didn't even let people who they gave the phone to know that. The back is definitely not cheap and plasticky, like the iPhone's backing, and feels like some sort of rubbery material. So, not smooth like the iPhone, but not as rubbery as the Droid. It's halfway in-between. As mentioned above, that an iPhone 3GS is still competitive — and more than competitive in many areas like media, user experience, apps, etc. — with devices released this week like the Nexus One is a testament to just how well Apple can make and support an iPhone. Even people still on the original iPhone 2G are enjoying a large part of the iPhone 3.1.2 OS release just a few months ago. That’s Apple’s forte — integrated devices with killer usability and software updates that reset the standards of expectation. The Nexus One, however, has all the best and brightest of the new technologies, like 1 GHz processors and AMOLED screens, augmented reality and awesome voice support in the built-in apps. Some people really do consider phones to be fashion, or always want to have the very newest thing on the market, and given Android’s model — which produced the Droid two months ago and the Nexus One today — Google is going to be very appealing to them. If you buy a phone every year or two, and want to build up your apps and accessories, the iPhone will likely keep you happy longer and more effortlessly. If you get bored easily and want something fresh faster, with more diversity, Android in general and the Nexus One right now are where it’s at. More information regarding iPhone 3Gs. More information regarding Google Nexus One.